At any given time, there are some 2,000 thunderstorms raging somewhere on Earth. The energy from those constant lightning strikes resonate through a cavity between the Earth's surface and the ionosphere. These are known as Schumann Resonances, and they in turn produce extremely low frequency (ELF) electromagnetic fields. For as long as life has existed on Earth, it's been bathed in these incredibly weak fields, but they were generally not thought to have any real impact. But in the new study, scientists at Tel Aviv University found that these fields could be exerting influence on life after all – thankfully though, it's a good thing. "We found that under controlled conditions, the Schumann Resonance fields certainly had an effect on living tissues," says Professor Colin Price, lead researcher on the study. "The most important effect was that the atmospheric ELF fields actually protected cells under stress conditions. 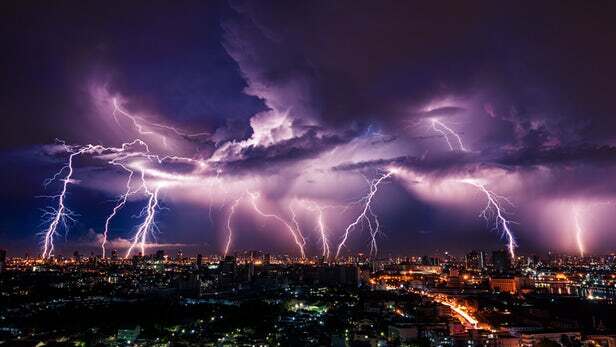 In other words, when biological cells are under stress – due to lack of oxygen, for example – the atmospheric fields from lightning appear to protect them from damage. This may be related to the evolutionary role these fields have played on living organisms." In their experiments, the researchers recreated the kinds of magnetic fields produced by Schumann Resonances, and cultures of rat heart cells were exposed to them. Within 30 to 40 minutes of exposure to fields with frequencies between 7.6 and 8 Hz – levels often found in nature – the cells changed in several beneficial ways. There were reductions in spontaneous contractions, calcium transients and the release of Creatine Kinase (CK), all three of which are measures of damage to heart cells. When the fields were switched off, the cells were found to revert back to their original state. Of course, this study was only conducted on rat cells in culture, so the results may not apply to other organisms, or even living rats. But it's still an interesting bit of evidence linking the effects of global lightning strikes to the evolution of life on Earth. "It is the first study that demonstrates a link between global lighting activity and the Schumann Resonances and the activity of living cells," says Price. "It may explain why all living organisms have electrical activity in the same ELF spectral range, and it is the first time such a connection has been shown. This may have some therapeutic implications down the line, since these ELF fields appear to protect cells from damage, but this requires further research."